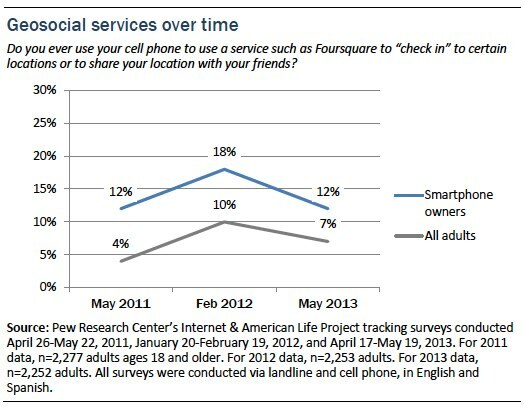 The rise of smartphones has brought real-time location data into many aspects of Americans’ lives. Some mobile services use the smartphone’s location to offer directions, targeted recommendations, or other location-specific information to the user. Other services incorporate a location “layer” into other types of functions, while still others exist specifically to share the user’s location with friends or the general public. To date, our surveys have tracked two types of location-based services: those that use people’s whereabouts to provide location-targeted information such as directions or recommendations, and geosocial services that let users “check in” to certain locations or share their location with friends. However, it is becoming increasingly difficult to delineate these two categories, as social media services incorporate location as an element of user activity and as location-centric services embrace varying degrees of social functionality. Meanwhile, social media services like Facebook, Instagram, and Twitter have added an optional location layer (in many cases built on Foursquare’s API) so that users can show where they are when they post material on the sites. And many information-focused services, from activity-tracking apps to rating sites such as Yelp, incorporate location-sharing and other social aspects as well. 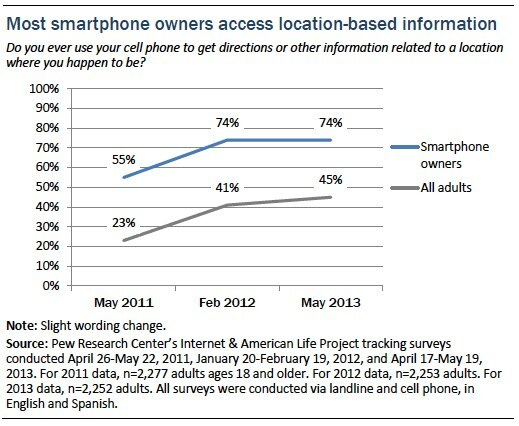 Some 74% of adult smartphone owners get directions or other information based on their current location. This works out to 45% of all adults. 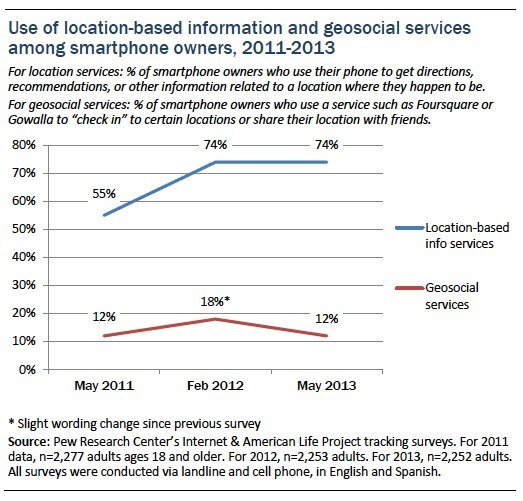 Some 12% of smartphone owners use a geosocial service such as Foursquare to “check in” to certain locations or share their location with friends. This works out to 7% of all adults. Many web services and apps incorporate a user’s location in order to offer relevant information. For instance, driving directions may rely on the user’s location to offer detailed turn-by-turn directions to another location, or a to-do list app might offer “geo-fenced” alerts, such as reminding the user to buy milk when she is near a grocery store. 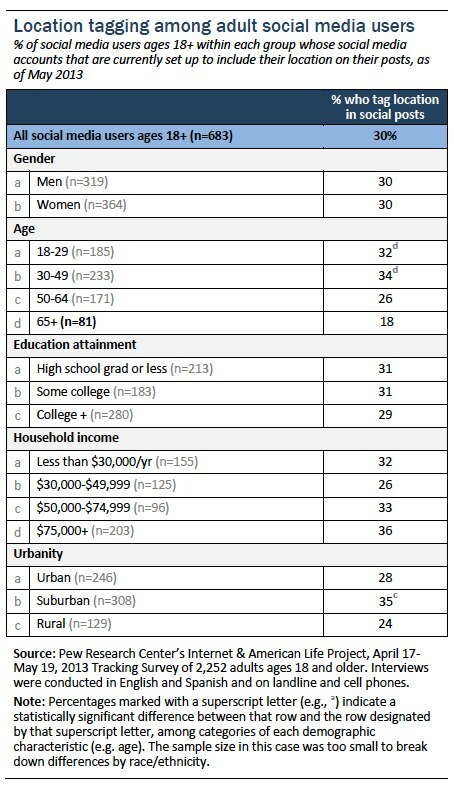 Smartphone users under age 50 are significantly more likely to say they get location-based directions and information than older smartphone users, and college graduates are more likely to do this than adults who only completed high school. There were no statistically significant differences among smartphone owners by gender, race or ethnicity, household income, or community type. These adoption patterns are generally similar to those we found in early 2012, though at that time whites were also more likely to use these services than African Americans, and adults in higher-income households were more likely to use these services than those in lower-income households. 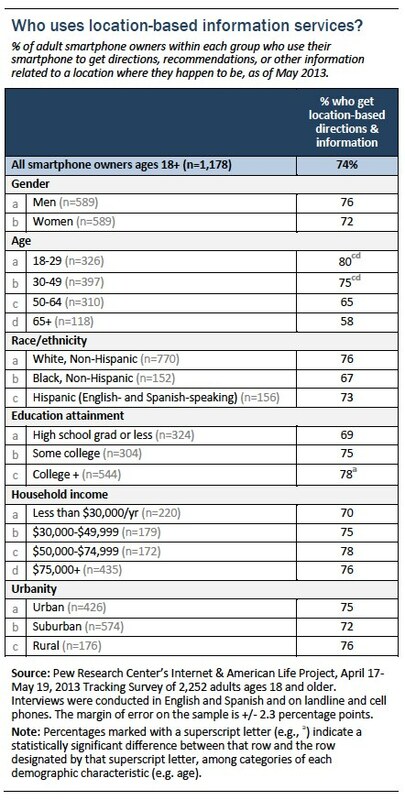 There are few clear differences in geosocial use between demographic groups, though Hispanic smartphone users are significantly more likely to use geosocial services than whites or blacks, and suburban adults are more likely to use these services than rural adults. Finally, there were no statistically significant differences in geosocial service use among smartphone owners by gender or educational attainment. 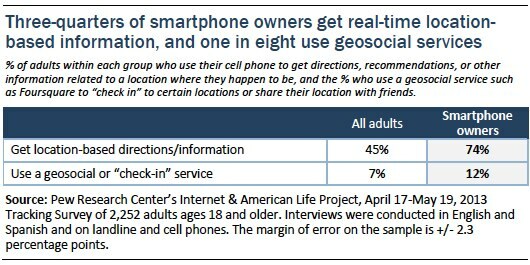 For the first time, we also asked users of geosocial or “check-in” services which location services they use. 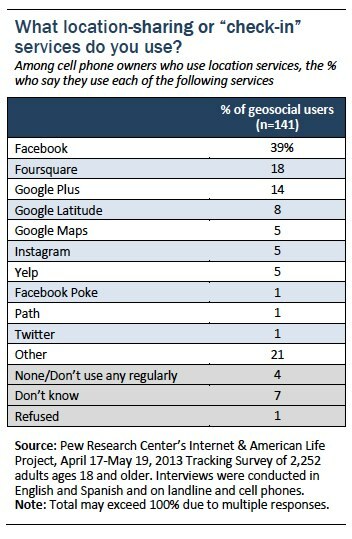 We found that a plurality of geosocial users (39%) say they use Facebook, while almost one in five (18%) say they use Foursquare, and 14% say they use Google Plus; several other services were mentioned as well, such as Instagram and Yelp. Social media users under age 50 are the age group most likely to tag their location on social networking sites, and those living in suburban areas are more likely to say they do this than those living in rural areas. 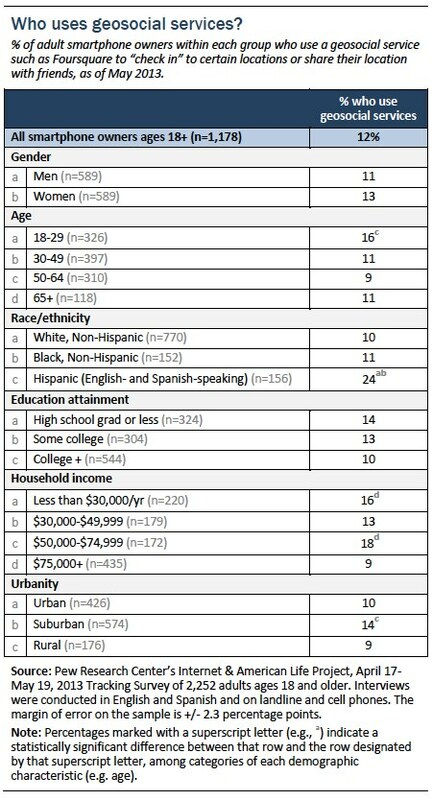 Among social media users, there were no significant differences by gender, education level, or household income. Boys and girls and teens of all ages and socioeconomic backgrounds are equally likely to say that they have set up their profile to include their location when they post. 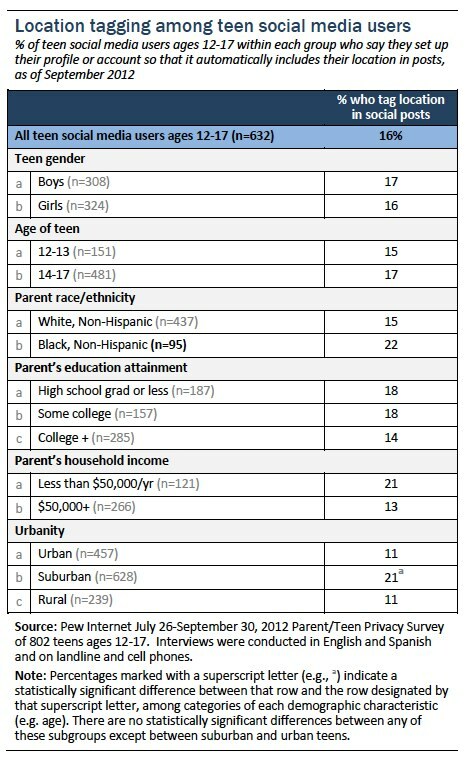 However, teen social media users living in suburban areas are significantly more likely to say they tag their location on social networking sites than teens living in rural or urban areas, as shown in the chart below. Focus group data suggests that many teens find sharing their location unnecessary and unsafe, while others appreciate the opportunity to signal their location to friends and parents. In a different report exploring teens’ mobile privacy practices, we asked teen app users ages 12-17 a similar but differently worded question. 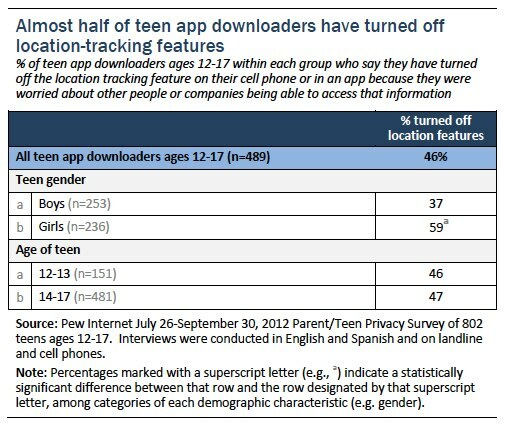 We found that as of September 2012, almost half (46%) of teen app users say they have turned off the location tracking feature on their cell phone or in an app because they were worried about other people or companies being able to access that information.